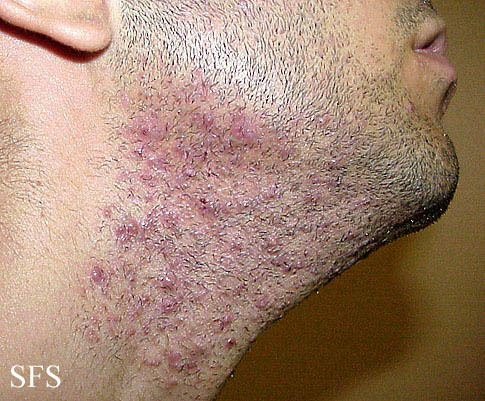 Itching of the beard area is not an uncommon problem, especially for men with facial hair. There are many reasons why itching may occur. Sometimes this can be harmless like with sweating and scratching the area. At other times however, itching of the beard may be due to some underlying disease like a fungal infection of the skin or even a bacterial infection of the hair follicles. Some of the possible and more common causes of an itchy beard are discussed below. It is important to note that there may be other less common causes that could also be responsible for skin irritation and itching of the skin over the bearded area. It is therefore advisable that the area is inspected by a medical professional who can reach a proper diagnosis. Washing and bathing regularly is important to remove dead skin cells, sweat, skin oils and dust from the skin surface, all of which can act as skin irritants. This can occur anywhere on the body but may be worsened with a beard since the facial hair may increase sweating at the area and trap extra sweat, skin oils and dust. It may be further exacerbated by very long and thick beards. Scratching the beard because of itching can further worsen the itching. Scratching causes trauma to the skin, especially with vigorous scratching. This trauma can directly lead to itching but may also increase the risk of contracting bacterial and fungal infections of the underlying skin. These infections in turn can lead to itchniess which prompts further scratching. While poor personal hygiene is a common contributing factor to an itchy beard, excessive washing and grooming can be equally problematic. Soaps, shampoos and even hair care products may acts as irritant and sometimes allergens thereby resulting in skin irritation and itching as may occur with contact dermatitis. Similarly excessive grooming may cause trauma to the skin and thereby lead to itching. Hair dyes in particular can trigger allergic reactions. Ingrown hairs is a common problem for some men with a beard. This is where hair curls inward back into the skin or grows out sideways into the follicle due to a blocked pore. It can cause inflammation of the follicle and lead to pseudofolliculitis (razor bumps). Men with thick or coarse hair and also with excessive beard hair growth are more likely to experience some ingrown hairs, especially after shaving. 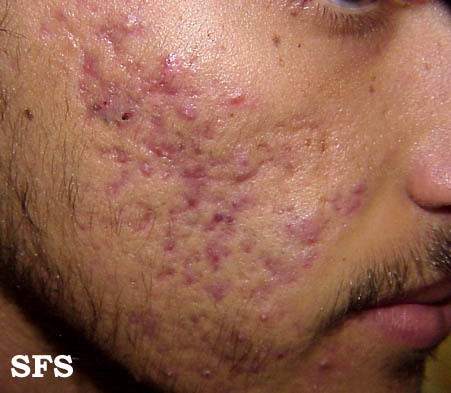 Men who are suffering with acne may sometimes experience worsening with beard growth. Although acne is usually associated with teens and young adults, it can start and persist at any age. It is mainly due to excessive skin oil secretion on areas like the face along with blockage of follicles and subsequent infection. Typically the itching would be accompanied by pimples which are red raised bumps on the skin that may be painful. Folliculitis is a condition where the hair follicles become inflamed. Most of the time it is due to a bacterial infection of the follicle. 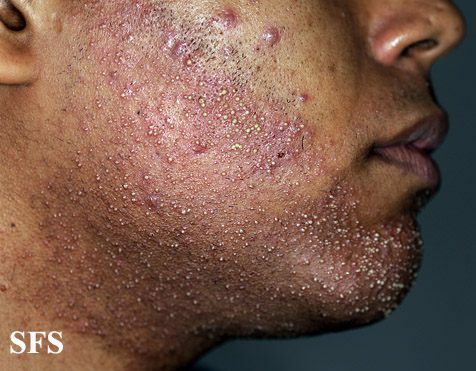 The bacteria known as Staphylococcus aureus is the more common infectious agent and folliculitis can occur both in bearded and clean-shaven men. Sometimes a more severe and deeper follicle infection can arise which can lead to permanent hair loss and even scarring. 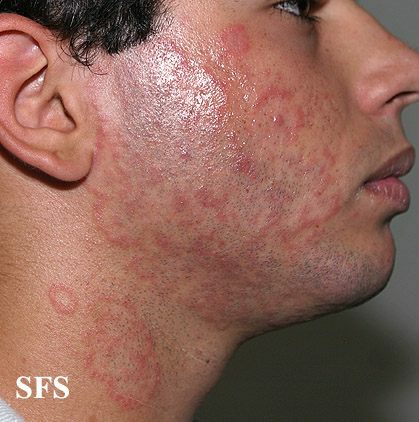 This type of folliculitis is known as sycosis barbae. A fungal infection of the skin and hair over a bearded area is a fairly common condition. It is also known as tinea barbae or barber’s itch. Sometimes the skin on the face and the hair on the bearded area may be infected separately by different fungi. It can lead to hair loss. These fungi are known as dermatophytes and have a predilection for digesting the protein keratin that makes up the skin and hair. It is also referred to commonly as a ringworm infection. The choice of treatment for an itchy beard largely depends on the underlying cause. Itching is only a symptom and while treatment may sometimes focus on easing or relieving the itch, the main approach should be directed at the cause. An itchy beard should first be investigated by a doctor, and preferably by a dermatologist or trichologist, before the appropriate treatment can be prescribed. Drying agents (topical) to reduce oiliness of the skin. Antifungal agents (oral or topical) for fungal infections. Antibiotics for bacterial infections like folliculitis. Antimicrobial ointments for superficial bacterial infections of the skin and/or follicles. Isotretinoin for conditions like acne vulgaris. Read more on itchy jaw. A number of simple measures can help to relieve beard itching and even prevent it. These measures should only be considered if there are no skin lesions like pimples, rash or facial hair loss. It should also be commenced only after consulting with a medical professional. Wash the beard area regularly and preferably daily. Use a mild soap and lather the area thoroughly before rinsing of all soap residue. Trim the beard, especially if sweating and oiliness of the skin are a problem. There is usually no need to remove the beard entirely unless an underlying medical condition needs to be treated. Avoid excessive grooming of the beard and do not use harsh shampoos. Also beware of hair dyes as some of these substances can trigger an allergic reaction, especially if it contains substances like PPD (paraphenylenediamine). Be conscious of excessive scratching whether itching is present or not. Scratching is not entirely avoidable but rubbing the area is a better way to relieve the itching. Also keep the fingernails short and clean at all times so that it does not cause any breaks in the skin or introduce bacteria into these wounds. Never pinch, squeeze or pick at any pimples or boils that appear in the bearded area. While it may appear to help flatten the lesion initially, it can also cause or exacerbate an infection. Always shave with a clean razor when neatening a beard or removing it altogether. Never share a razor and ensure that the blade is sharp and clean.